Beautiful family friendly home just across the street from a white sand beach that is walkable for a mile, kayak friendly, and swimmable. The great room, dining areas, and kitchen are all open for large family gatherings and dinners. All the bedrooms have A/C, TV's, queen beds. The master suite has a king bed, personal kitchenette, and a large bathroom. There is a second master bedroom w/ private bath. A third bathroom in the hallway services the other 2 bedrooms and the family room. Cool, comfortable, and furnished nicely. Lots of great art too. Close to the beach with 'deeded beach access' and very roomy! 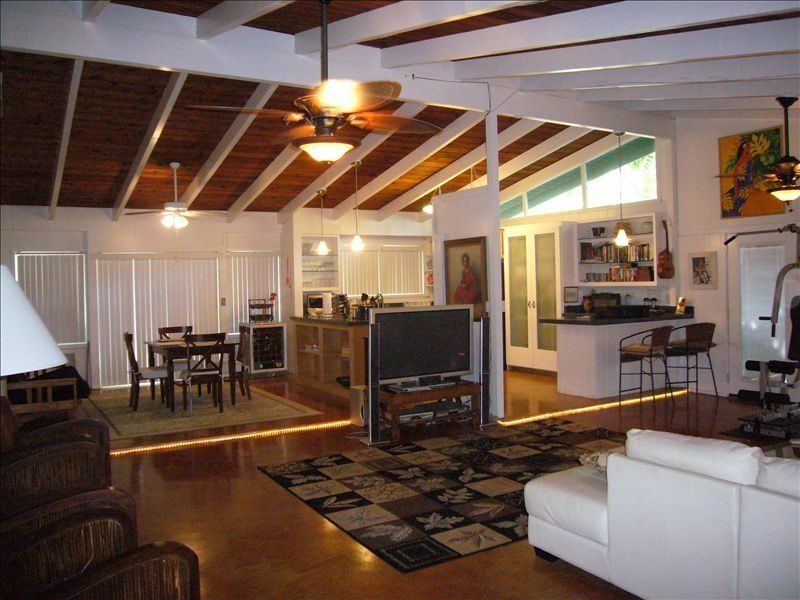 Plenty of room for a large family and easy access to the Punalu'u Beach Park across the street. This is a large open concept home with all amenities needed while on vacation. The bedrooms are huge and each have a TV. It is a 1 minute walk to sandy beaches. Jim was amazing. He attended quickly to anything we needed. We are definitely staying there again!! Thank You for the nice review! I enjoyed that bottle of wine you left me last night! Enjoyed the house. Thank you! This property was a great place for us all to come together. Plenty big enough for the 7 of us. Quiet place to come home to after adventure-filled days. Huge home for our party of 10. Perfect layout for privacy with three different families. Jim met us and was wonderful with the tour and explanation of the property. View of ocean is obstructed, but can see a bit over the gates. The size was of the home was of greatest benefit to us. We didn’t utilize outdoor extras. Mahalo nui for your hospitality, Jim! Just returned from a six day, five night vacation for three couples plus an infant. Jim was there to greet us on our arrival. He personally walked us through the home, gave us good, detailed instructions, and even included an unexpected welcome basket full of snacks. The Master bedroom/bath is amazingly comfortable and the other bedrooms suited our needs just fine. We were impressed that the home comes with a crib and high chair which was a welcome sight to the parents of the infant. The location is right on the main road with easy access 5 miles south to the Kualoa Ranch and 5 miles north to the Polynesian Cultural Center. The home also has plenty of beach gear. We were so busy we only used the gear one time but it came in handy. The home did warm up in the afternoon and the A/C in the vaulted great room and kitchen had a little trouble keeping things cool. Once the sun set it did not take long for the A/C to effectively cool. All of the rooms have individual A/C units and they seemed to cool effectively at any point during the day. We would stay here again. Jim was very accommodating when we needed to change our visit dates at the last minute because of an issue beyond both of our control. Jim could not have been nicer the way he handled things. And, if you like art, Jim owns an art gallery not too far away. We enjoyed our visit to the gallery and even purchased an item to bring back home. Spacious!! Everything you need for a home away from home. Great location for a relaxing vacation. Definitely booking for our next return visit. Perfect for our off island getaway! House is huge and more then big enough for the 8 of us! Loved the house! East Oahu, 35 Minutes from Honolulu/Waikiki or Northshore,Haliewa.